Korean BBQ Beef called “Bulgogi” is a quintessential salty and sweet dish everyone loves. This paleo and keto-friendly version is our favorite meat recipe and it will be your family’s too. 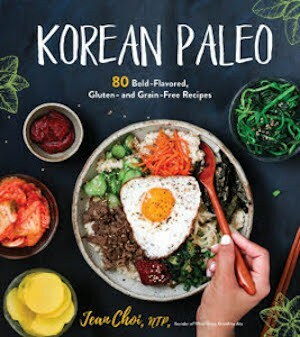 If I were to write a Korean Paleo cookbook, it would be very similar to Jean Choi’s recently published “Korean Paleo: 80 bold flavored gluten and grain-free recipes” cookbook. 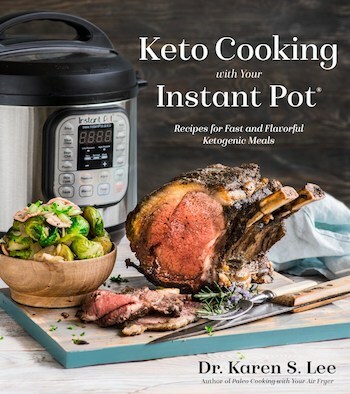 In fact, most of the recipes in this lovingly crafted collection of authentic Korean recipes that have been paleofied are dishes we eat on a weekly basis. These are recipes I grew up with and my family requests very often. Korean BBQ Beef, “Bulgogi”, is a special dish that we used to eat on special occasions like holidays, birthday, and celebrations of some kind. Bulgogi is full of umami from soy sauce and pureed fruits like apples and Asian pear. The fruit puree tenderizes the meat and adds sweet flavors while deep salty soy sauce envelop the meat. We used to mix the salty-sweet meat dripping from the dish with hot rice to sop up every drop of the flavors. Since we’ve been on ‘lazy keto’, I try not to add fruit puree to Bulgogi but if you are not following a keto diet, adding fruit puree adds another depth to this popular dish. Jean was generous enough to allow me to share her recipe so scroll below for the full recipe and her meat tenderizing tip. 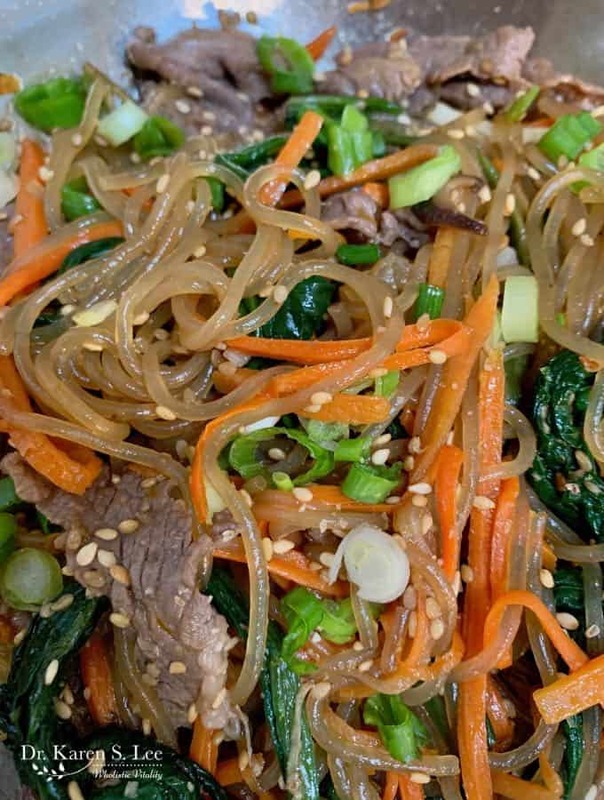 And what’s a Korean cookbook without mentioning JapChae – sweet potato noodles with mixed vegetables and beef – especially if you’re following a paleo diet since these noodles are grain-free. I also have a recipe for Japchae here as it is also one of the most popular Korean recipes everyone loves. Jean uses maple syrup but again, there’s nothing wrong with using it if you are not watching carbs. 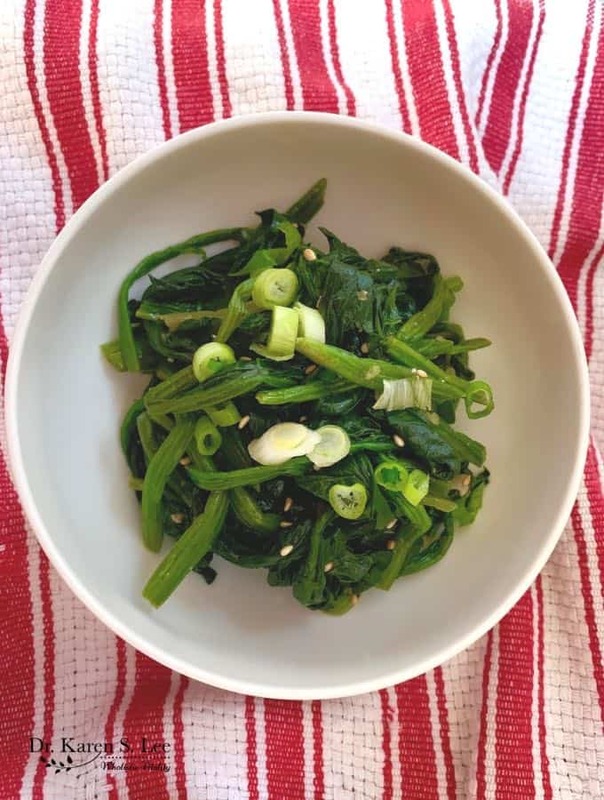 I love her section on Banchan – a smorgasbord of side dishes that Koreans are famous for. They are a myriad of seasoned vegetables – usually FREE if you dine at a Korean restaurant – that accompany your main meal. One of my favorites is seasoned Spinach Salad. It looks plain but it’s so flavorful and you can really taste the freshness of quickly blanched spinach with seasonings. It’s very simple to make and it can be eaten as a side and also be added to Japchae (P.89), Kimbap (P.15), and of course, Bibimbap (P.11). There are so many more recipes that I could mention, like Kimchi, Chicken Stews, Dumplings, Soups, Stews, Pancakes, Sauces, and even desserts! But I’d have to write over 1000 words and I rather you go buy Jean’s book. 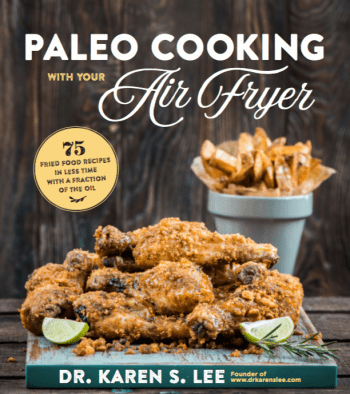 “Korean Paleo” to try all the recipes yourself. If you already tried Korean food, you will be addicted to her recipes and if you haven’t tried Korean cuisine, you will love it. She even has Korean “Fusion” recipes to convert your favorite dishes like pizza, tacos, fries, burgers, and more with bold Korean flavors! 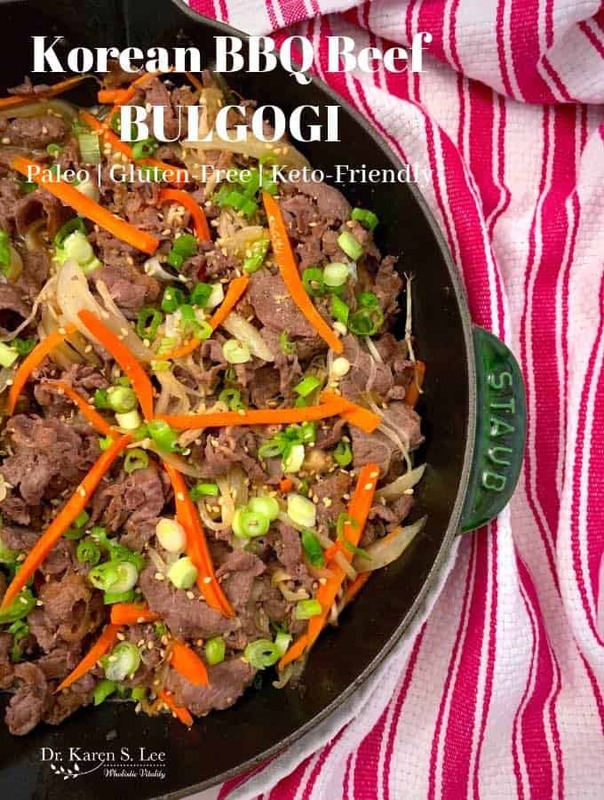 Now here is the Bulgogi recipe from the book. Place the beef in the freezer for 30 minutes, then take it out and slice it thinly, about 1/16 to 1/8 inch thick. Place the coconut aminos, pear, sesame oil, ginger, garlic, vinegar, sea salt, and black pepper in a high-powered blender. Blend well until liquified. Combine the sliced beef and the marinade in a large bowl. Toss and massage together with your hand until all the beef slices are covered in the marinade. Cover and marinade in the refrigerator for 1 hour to overnight. When you are ready to cook the beef, remove it from the marinade, shaking off the excess. Slice the onion, green onions and carrot, and combine the vegetables with the meat. Heat the cooking oil over high heat in a large skillet. Working in batches so you don't overcrowd the pan, add the beef and vegetables and stir fry together until the meat is browned and cooked through, about 5 to 7 minutes. To make the recipe keto-friendly, leave out the Asian pear and serve over cauli-rice or over zoodles or lettuce wrap.